Product Description Palace "Oro" set. At every dinner party, the table is the centerpiece. 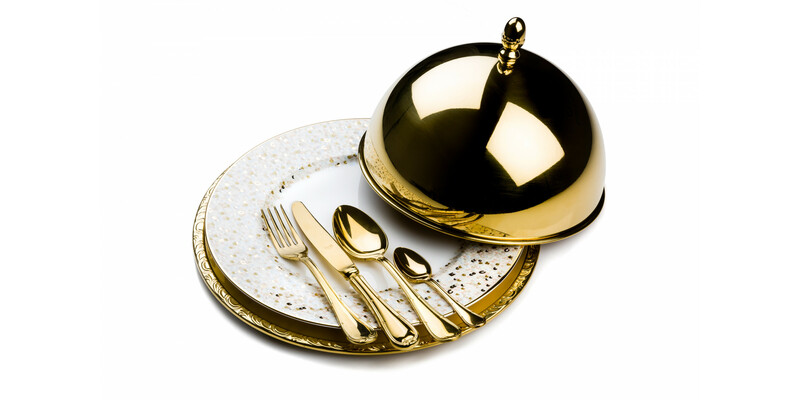 The following Golden place setting will help you set the perfect table. The set includes: - Cloche 24cm - Round Underplate Barocco diametre 32.5 cm - Cutlery set Raffaello Oro with the choice between: - 4 piece setting: Dinner fork, Dinner knife, Dinner spoon, Coffee spoon - 5 piece setting: Dinner fork, Dinner knife, Dessert fork, Dessert spoon, Coffee spoon Fine China is not included in the set. Fine China is not included in the set. Crafted in Italy, these products blend classic functionality with unique designs for contemporary lifestyles. A perfect combination of color and sophistication.